Could Performance Pay Work For Michigan Educators? | Gary G. Abud, Jr. Since the introduction of House Bill 4625, it has been brought to my attention by Tom Gantert at the Mackinac Center that the Michigan Teacher of the Year earns a salary that ranks less than nearly 80% of the other teachers in the same district. It is argued that this is based primarily on years of experience or educational degrees earned. While there could certainly be a more complex model for compensation of educators, the language of HB4625 seeks to remove experience from the model. For that reason, I stand with the State Board of Education on opposing the legislation as it is currently written. A Michigan Capitol Confidential article threw me into some serious reflection back in June on how teachers are compensated currently, the proposed changes intended by the proposed legislation, and whether a better model could loom in the midst of this legislation. Though some teachers’ work is in a different specialty area than science, my area of expertise, we are all working for students first and foremost. I am privileged to work with other award-winning, nationally and state recognized teachers in Grosse Pointe, all of whom have the best interest of students at heart, and many of whom have mentored me to become an exceptional teacher. There are many outstanding teachers in this state, and more needs to be done to keep them in the profession for the best interest of our students. In Grosse Pointe, I feel exceptionally supported as an educator and I am provided with some of the best opportunities to develop as a professional and hone my talents. Not all teachers are privileged to work in schools where they attract and grow top talent. Often, a lack of support and development for teachers is a strong turn-off to educators entering the profession. Is this addressed in compensation models currently? No. However, it certainly is not taken into account by HB4625. Retaining top talent in schools is about more than just money, as many would have you believe. Teacher attrition is at an alarming fraction in our state, especially among newer teachers, and that is unacceptable; however, extrinsic motivators such as compensation are not the only way to keep great teachers in the field. It is not what goes into a teacher’s wallet, but what comes from their heart, that guides their decisions about classroom practice. Excellent teaching is something that has to first come from the heart, and the heart must be supported in order to thrive. Supporting teachers in a variety of ways, in addition to compensation, will contribute to reducing the attrition in the profession and keeping the top talent in front of our students. Blows to the hearts of educators, such as negative public rhetoric directed toward Michigan teachers, will propagate a seemingly hostile professional environment that discourages the best and brightest from entering and remaining in the field. While I understand that the current model on which salaries are determined for teachers in public schools has relied heavily on experience and completion of higher education, this model does not accurately reflect the complete picture of effective teaching practice. Without including more information on actual classroom practice, only part of the story is being told through experience and background education. Effective teaching practice resembles effectiveness in other professions, such as medicine, art, music, and journalism. We know that a journalist with more experience covering complex issues will likely have a more sophisticated voice when they write a story, but that does not mean that a less experienced journalist cannot emulate the same practices as their experienced counterpart to achieve high quality writing in their work. Standards and best practice guidelines exist for many professions, including medicine, news media, and education. The best practices in education need to be modeled by veteran teachers for new teachers and required of all in the profession. Although I recognize that, with experience, all professionals can improve in their field, I do not believe that seniority or advanced degrees are the only factors that should be considered in determining a teacher’s effectiveness and compensation. Performance pay could have a place in education if it is not conflated with incentive pay or used as an ‘if-then’ extrinsic motivator. 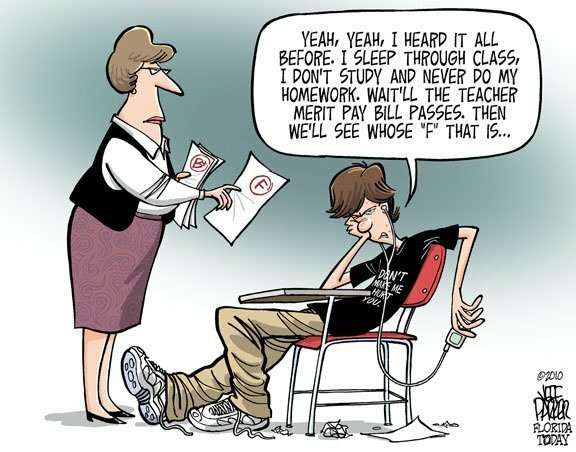 Pay-for-performance for teachers based on student test scores is nothing new; however, incentive pay, or pay-for-performance, goes against the conclusions of behavioral science when it comes to cognitive work like that of teaching, medicine, or journalism, (Pink, 2011). Furthermore, a Springer, et. al. (2011) study of incentive pay for teachers found teacher incentives had little effect on student achievement. Performance-based compensation is not the same as incentive pay nor commission, and this distinction should be made very clear to all Michiganders, because compensation-driven decisions are not what are best for Michigan’s students. With regard to House Bill No. 4625, the language of the bill outlines a change in the framework for compensation models, specifically that they should “[include] job performance and job accomplishments as a PRIMARY factor” and performance should be, “at least in part based upon data on student growth as measured by assessments.” The current language of the schools code is nearly identical, except that the performance and job accomplishments are (currently) “a SIGNIFICANT factor.” This subtle, yet monumental, change according to the language of the bill, as is written, still does not seem to endorse any particular assessment, but rather “objective criteria,” as the yard stick of student growth. It makes no elaboration on “job accomplishments.” The bill also emphasizes using a “fair” system, yet experience is thrown out of consideration in the proposed model. Michigan School Code Sec. 1250, which is locally determined, already included performance pay language similar to House Bill No. 4625. This was part of the “Race to the Top” legislation passed in December 2009, signed by Gov. Granholm in January 2010. Ultimately, effective teaching should be evaluated and compensated using a multifaceted approach determined at the local level with educators at the decision-making table. Though professional experience and level of education can contribute to the effectiveness of classroom teaching, these should only be part of the whole teacher evaluation and compensation picture; instead, a comprehensive model that includes implementation of best teaching practices, professional accomplishments, continuing professional development, teacher leadership, contributions to the student learning experience, and student growth on assessments should be developed to utilize in schools. Without considering several factors in teacher evaluation and compensation, the entire system is reduced to a single factor model. Can a one-dimensional approach truly be fair?